We are pleased to report that the Safe Links service issue is now resolved and we have re-enabled Safe Links. To recap, Safe Links provides extra protections for the Middlebury community from phishing attacks and other malicious email activity by providing time-of-click verification of web addresses (URLs) sent via email. Thank you for your patience while we worked to resolve matters. Again, we apologize for the disruption. Please contact the Help Desk if you have any outstanding issues or questions. This entry was posted in ITS, Library, LIS Staff Interest, Middlebury Community Interest and tagged Helpdesk Alert on January 30, 2019 by Cynthia Slater. Microsoft is making significant progress towards resolving the issue with the Safe Links service. In most all cases now, clicking on a link sent to you via email works on the first try. If it doesn’t work, you can typically try again, and the linked website will open. We are sorry for this disruption in service and any inconvenience. Thank you once again for your patience. We will provide an update as soon as we have more information. This entry was posted in ITS, Library, LIS Staff Interest, Middlebury Community Interest and tagged Helpdesk Alert on January 29, 2019 by Cynthia Slater. We are experiencing an issue with the Microsoft Safe Links service which means you may receive a “503” error if you attempt to click on a link someone outside the organization sent to you via email. We are working closely with Microsoft to resolve this issue as swiftly as possible. Microsoft has confirmed that this is an issue with their service impacting customers globally. We do not currently have an estimated resolution time. We have temporarily disabled Safe Links for new, incoming email messages. We will re-enable the Safe Links service after Microsoft has solved the problem. We will provide an update as soon as we know more. We apologize for this disruption. Thank you for your patience. On January 31, 2019, Information Technology Services (ITS) will enable a feature on the Virtual Private Network (VPN) system that will detect if your VPN software needs to be upgraded to the latest release. 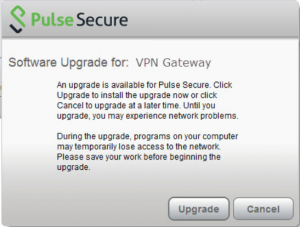 If an upgrade is indicated, you will see a popup window from the Pulse Secure VPN application informing you that “An upgrade is available for Pulse Secure.” Please click on “Upgrade” to complete the upgrade process. Keeping the client up to date will ensure that all security updates have been applied. If you have concerns or issues with this upgrade please contact the Help Desk at http://go.middlebury.edu/helpme/, helpdesk@middlebury.edu, or 802-443-2200. This entry was posted in ITS, LIS Staff Interest, Middlebury Community Interest, middpoints, Post for MiddNotes, Post for MiddPoints on January 23, 2019 by Petar Mitrevski. Zoom’s status page is reporting that services are restored. If you continue to have issues, please restart the application and then submit a Helpdesk ticket. We are experiencing an issue with Zoom video conferencing. According to Zoom, “customers are experiencing slow connection to Zoom web services and issues connecting to Zoom meetings.” Zoom is working to resolve the issue. We do not currently have an estimated repair time but will provide an update as soon as we know more. Please submit a ticket with any questions or concerns. This entry was posted in Helpdesk Alerts, ITS, LIS Staff Interest and tagged Helpdesk Alert on January 9, 2019 by Mackenzie Pauly. ITS is aware of an influx of sextortion scam emails received by members of the Middlebury community. These are indeed scams, identified as such by online security sources (see below) and making the rounds on the Internet once again. Recent samples have been personalized with older passwords stolen from breaches of third-party websites, such as Linkedin, Adobe, etc.. Please forward any sextortion scam emails to phishing@middlebury.edu so that the sender addresses can be blocked! These are indeed scams. Recent samples have been personalized with older passwords stolen from breaches of third-party websites, such as Linkedin, Adobe, etc.. Here is a resource to help you find out where an old password to a 3rd party site may have been exposed: https://haveibeenpwned.com is run by Troy Hunt, a globally recognized security expert. Change that password anywhere you use it and this time, pick a different STRONG password for each service. 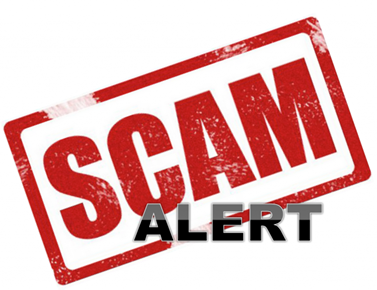 Again, please forward any sextortion scam emails to phishing@middlebury.edu so that the sender addresses can be blocked from bothering our community members! This entry was posted in Helpdesk Alerts, ITS, libitsblog, LIS Staff Interest, lisblog, Middlebury Community Interest on January 2, 2019 by Chris Norris. We are pleased to report that the Multi-Factor Authentication service is restored. Microsoft reported service restoration around 2:00 PM on Monday. Microsoft provided additional guidance stating they would continue to monitor the situation closely. We’ve been doing the same and can confirm that the MFA is working. MFA challenges are working as expected, across all verification methods. Thank you for your patience while we worked to resolve matters. Again, we apologize for the disruption. Please contact the Helpdesk if you have any outstanding issues or questions. This entry was posted in ITS, Library, LIS Staff Interest, Middlebury Community Interest and tagged Helpdesk Alert on November 20, 2018 by Cynthia Slater.